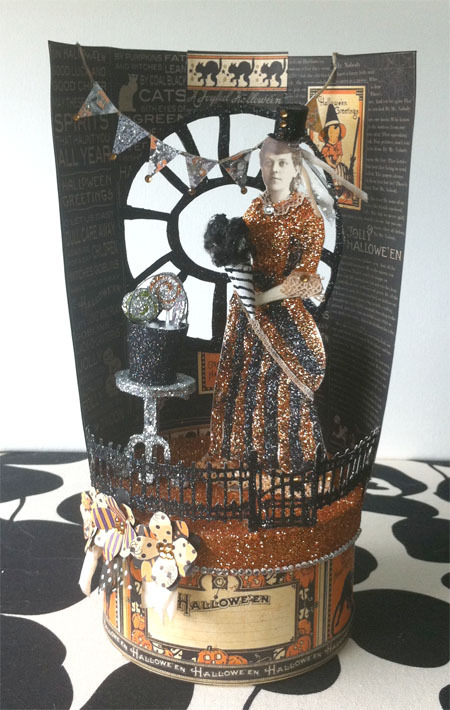 Graphic 45, Art Glitter & Want to Scrap Blog Hop! 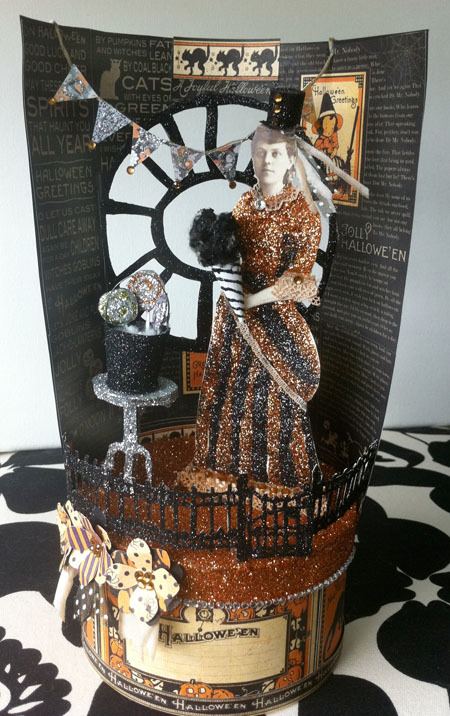 After you check out my project below, go visit Graphic 45, Art Glitter and Want2Scrap’s blogs for more projects. Each day, the above three blogs will feature different artists… so much inspiration! Graphic 45 has an amazing goody pack of prizes that you can win if you visit their blog and follow the instructions on how to comment to enter the giveaway. They are also giving away 2 prizes on their facebook page and Pinterest page. 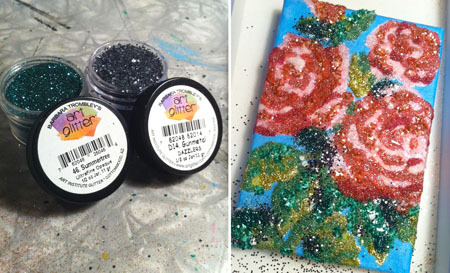 Art Glitter will be giving away FOUR $25 gift certificate prizes! 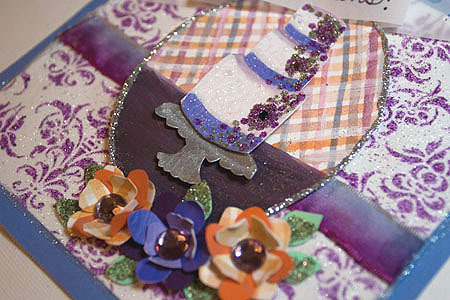 Just leave a comment on the Art Glitter Blog by Sunday July 29th! Want2Scrap will be giving a $100.00 giveaway to one lucky person who comments on their design team’s blogs as well as the Want2Scrap’s blog! Make sure you visit each day and enter to win. Stop by the Want2Scrap Facebook Page this week and tell them you joined in the hop for a second chance to win a prize! And here’s what it looked like all finished! 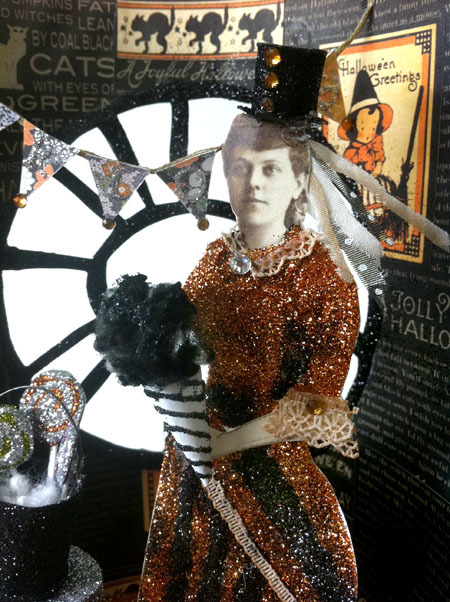 Her dress is made entirely of glitter and glue directly on the color copy of the original. Paper flowers and notice the trail of rhinestones on the right. It’s one big piece! 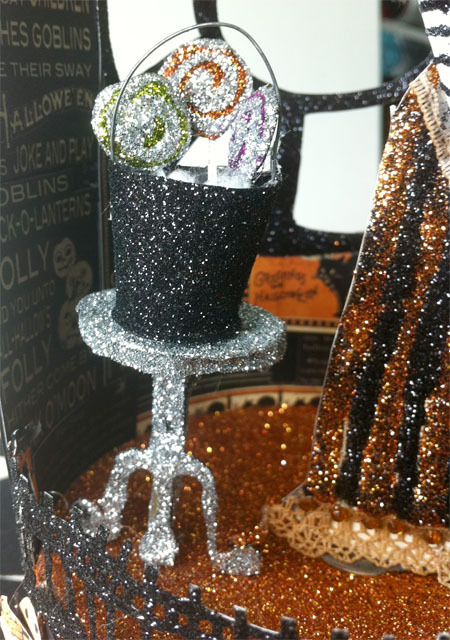 Love this item from Want2Scrap! I hand stained this white lace using watercolors. 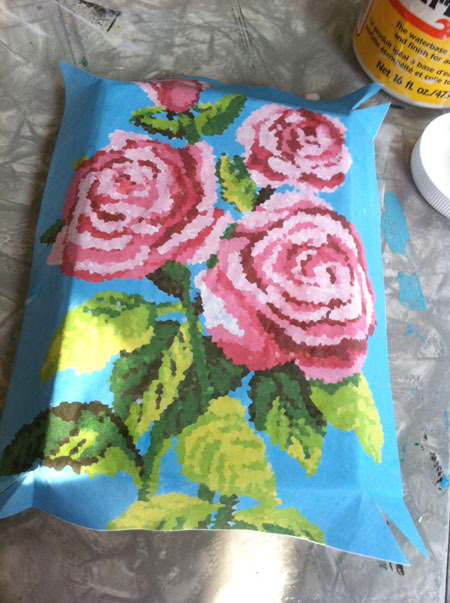 Here is my take on painting by number, but there aren’t any numbers and you are using glitter ;) It’s just like painting, but you’ll be using glue and glitter on a template instead! 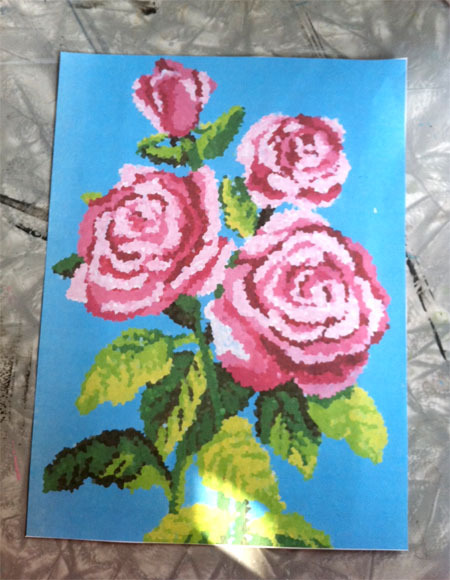 *For my project, I used an image I had already painted that was sort of paint by number. I took this image into photoshop, sized it and then ran it through the “Crystallize” filter. You can also use a mosaic filter, pixelated filter etc etc. 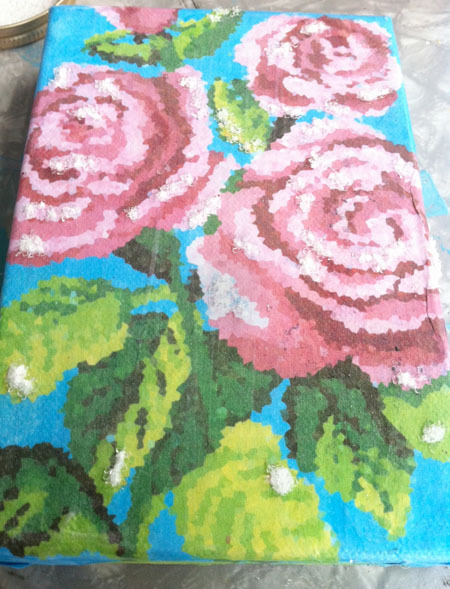 You can also use a napkin, cross stitch pattern or any other image you like, directly on the canvas. You’ll just need to figure out your shading and color scheme. If you’d like to use my image, you can find it by going to: http://ebay.violetsareblue.net/2012/blog/may/01/glitter_by_number.pdf and downloading it. 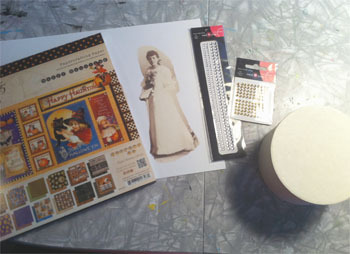 Your canvas, image, gluing implements for this step and scissors. So, to start, you’ll need to cut out your image to 5.75″ x 7.75″ (Which is 4″ x 6″ with a 7/8″ border on all four sides). I’m going to wrap my image around this canvas, but you don’t have to. I just like the finished look better! See how up close you can see the pixels? 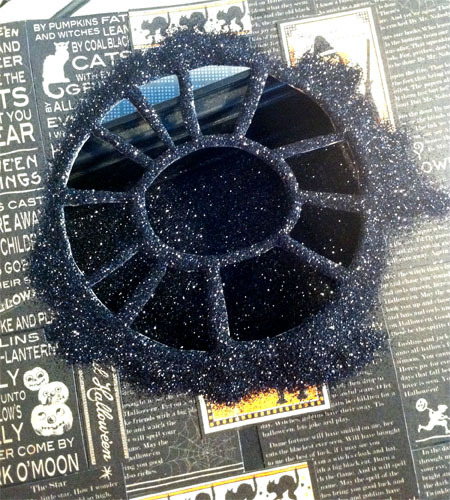 This will make it easier to figure out where to put your glitter colors. 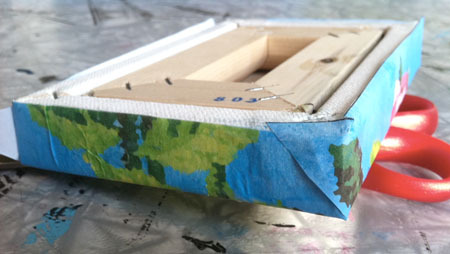 Now align your image on the canvas so it’s centered and even and fold the edges down a bit. Now get ready to make a mess with that old paintbrush! Then, put your image back on top and centered… Try to not get Modge Podge on the front of your image too much. If it is wet on top, it could bubble up more. 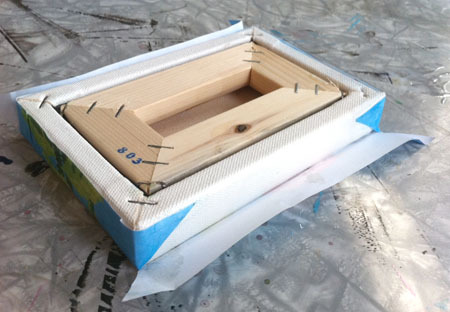 I like getting the back wet and adhered FIRST, letting it dry, then putting a top coat. 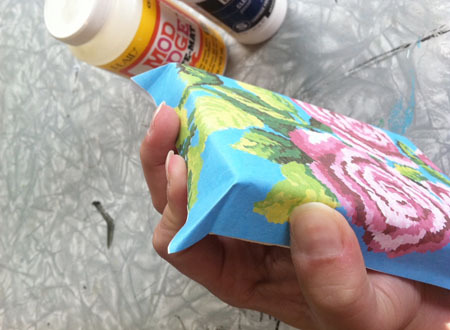 Use your fingers to smooth out the bubbles and then start smoothing out the top and bottom, as shown… it’s like wrapping a present! Keep on smoothing and wrapping. Yes, your fingers will be blue at this point, but it will come off! You will be getting a little bit of the Modge Podge on the top of the image, but that’s okay. We just don’t want it swimming in wet adhesive right now! It’s not perfect, but it’s the back! 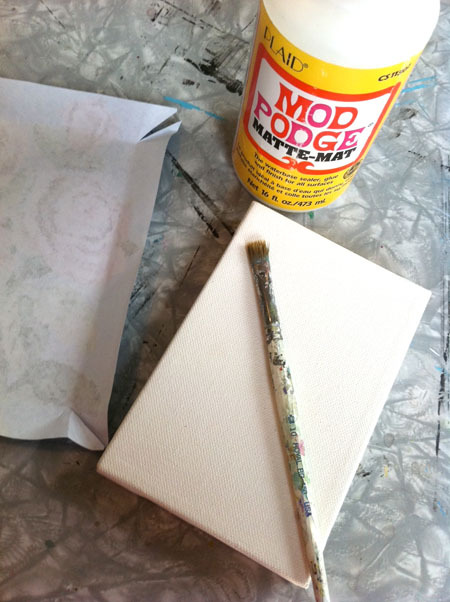 If you need more Modge Podge at this point, add some using your brush. Voila! It’s wrapped! Let dry for about an hour. 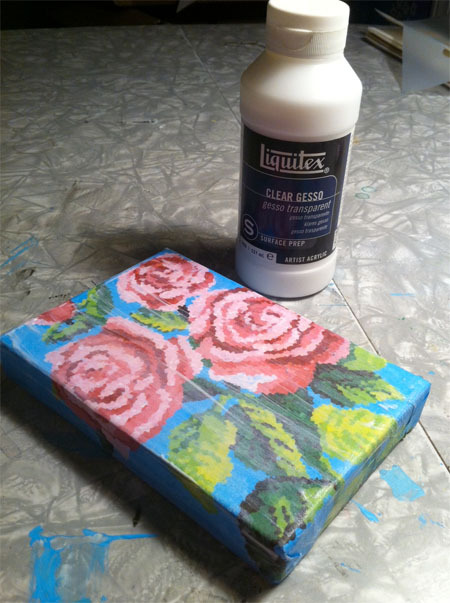 Now, you’re going to coat your image with the clear surface prep Gesso. 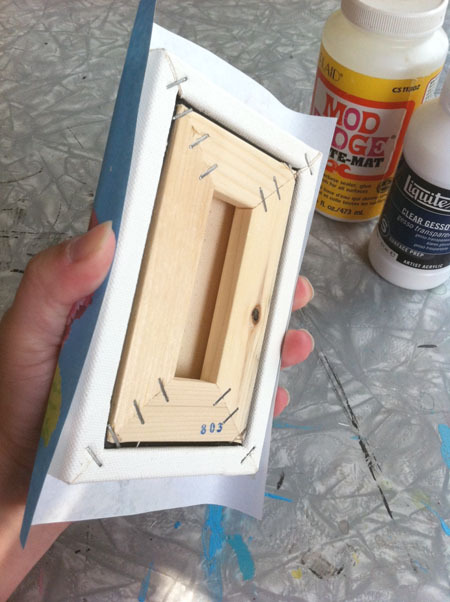 You could use Modge Podge on the top, but I prefer the grittier, not-so-glossy Gesso. I let this dry overnight, but you could let it dry for about an hour or two. 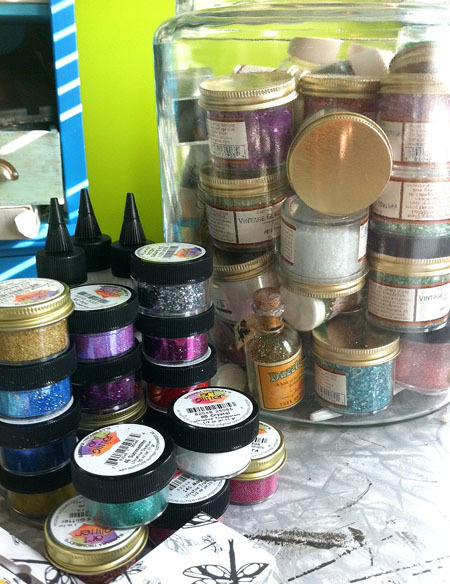 Behold… most of my glitter collection. Various colors, shapes, mediums and coarseness. 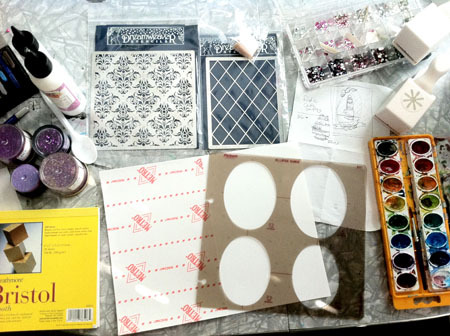 Glass glitter, mylar glitter, tiny plastic or metal beads… I’ve got lots. 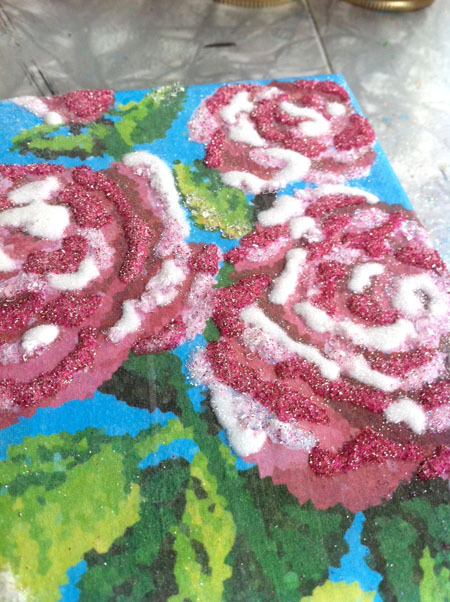 I’ve decided that I’m going to use 5 shades of glitter for the roses. 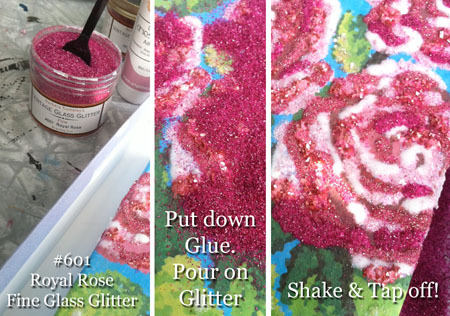 Clear (in shards and in fine), light pink, a darker pink, a deeper magenta and then a red/magenta mix for the deepest part of the roses. Specific colors and brands are listed below. 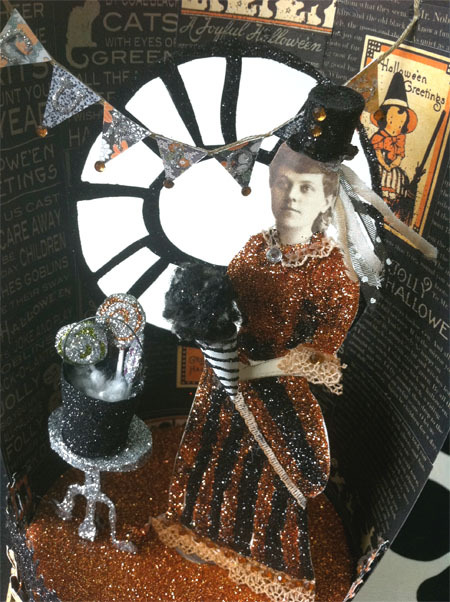 I’m using mylar and glass glitter in fine and coarse. 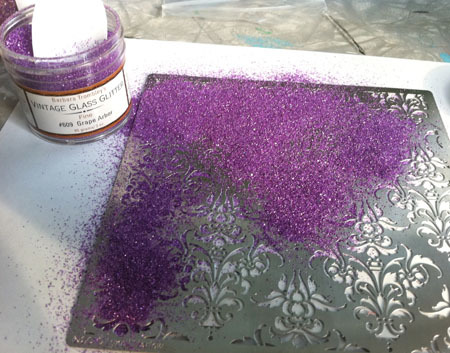 Please use extreme caution when using glass glitter! I wear glasses and am careful not to get it on my hands and I keep the dog away from my crafting table when I’m using it! 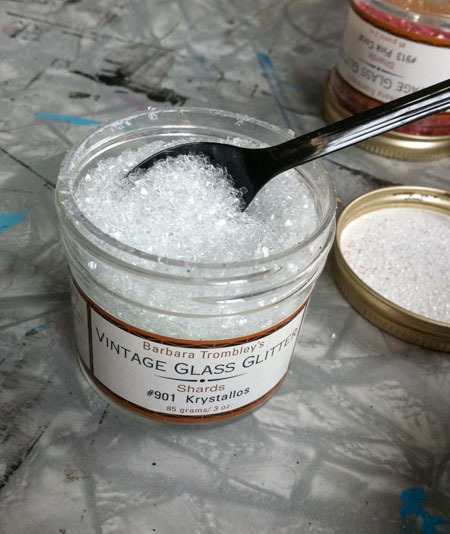 Glass glitter is amazing because it sparkles so much and has a rich, vintage feel to it. It just makes my pieces look and feel more special. I’m starting with the lightest color. Clear glass shards on just the tips of the roses and leaves. 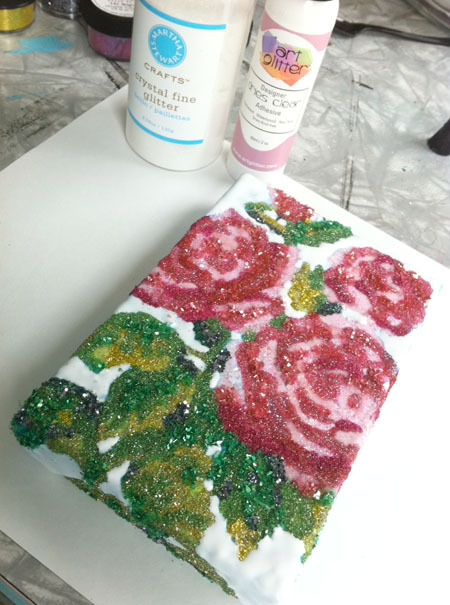 I’m using Art Institute Glitter #901 “Krystallos” Shard Glass Glitter. I’m not using too much of this, but I want to use it first so that I can easily scoop up the “overshake” glitter and use it again without it getting mixed with any other colors. Trying to keep it pure ;) I always return the excess glitter to the jar after each colored glitter application. I also have a large paint brush reserved just for sweeping up glitter from surfaces. 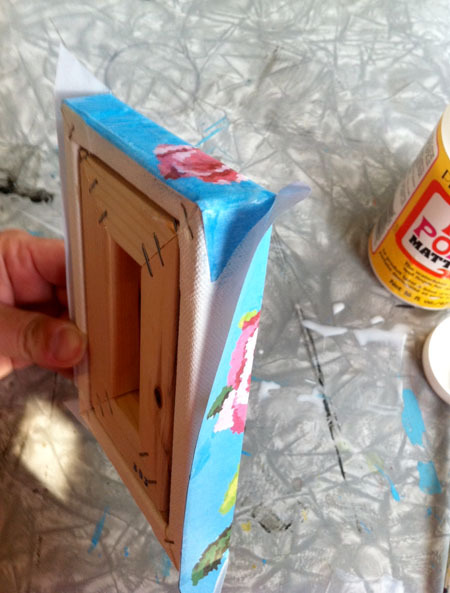 Daub your glue on the lightest color pink and green areas. 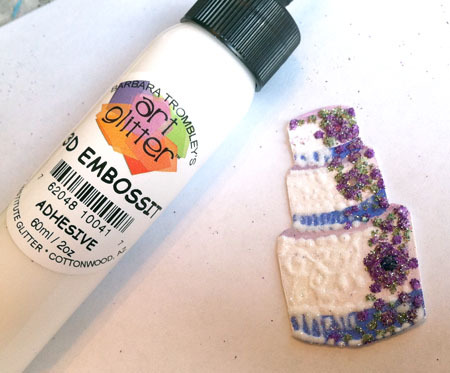 I’m using the Art Glitter Institute clear adhesive. Turn the canvas over and shake off the excess. 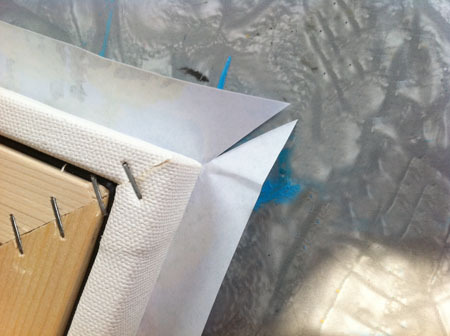 I like to tap the back of the canvas with a large pen or my scissors to tap off the excess glitter back into the box. 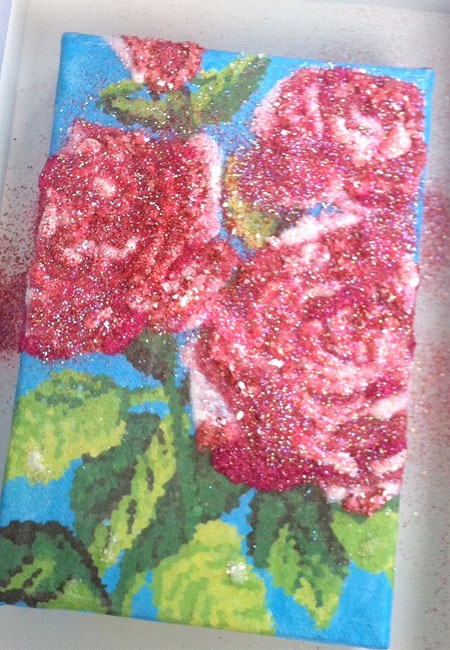 Next, I’m going to add my lightest pink fine glass glitter. I’m using Art Institute Glitter #616 “Primrose” Fine Glass Glitter. 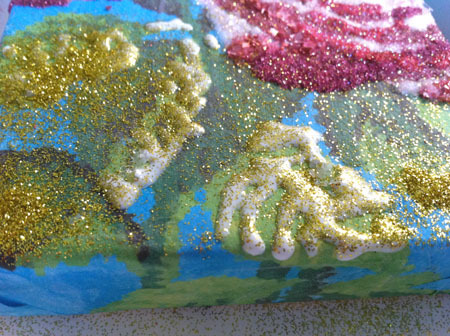 Don’t forget to add glitter to the sides of the canvas, too! I’m going with a generic Martha Stewart clear fine glitter. This will pick up the light pink underneath when it dries clear. 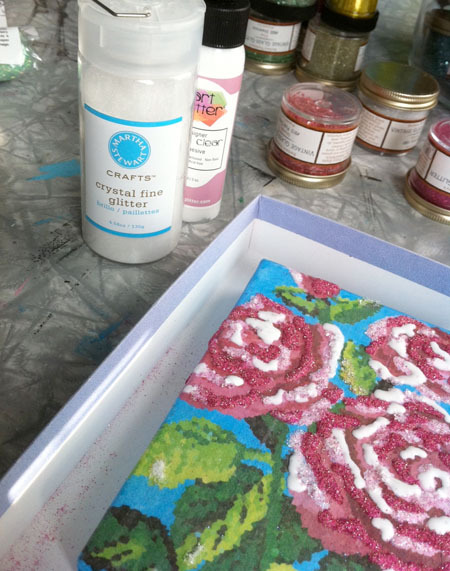 Don’t forget to add glitter to the sides of the canvas, too! 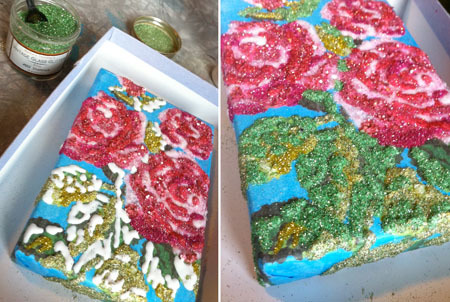 Pour on glitter, shake & tap off… and this is what it looks like! 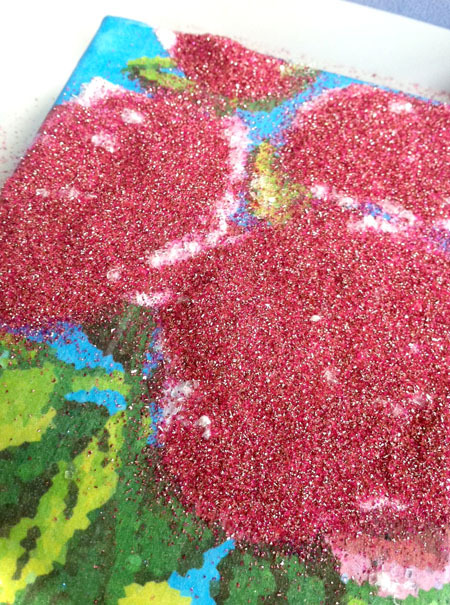 Now we’re adding the slightly deeper pink glass shard glitter. 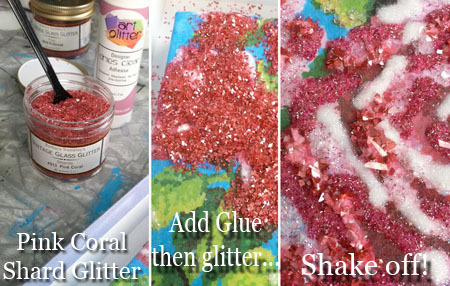 I’m using Art Institute Glitter #913 “Pink Coral” Shard Glass Glitter. Put down your glue, add glitter, shake & tap off. 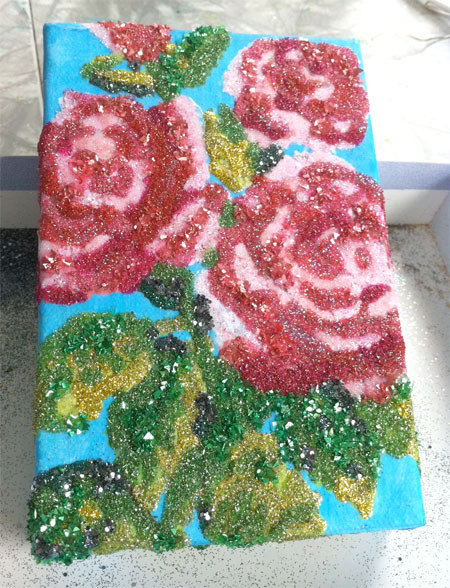 Don’t forget to add glitter to the sides of the canvas, too! 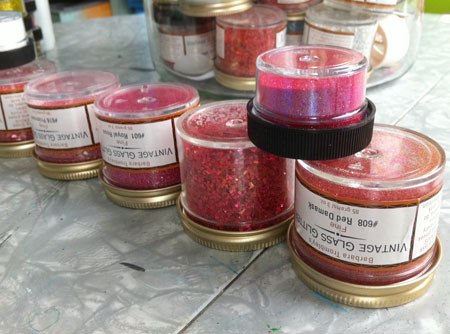 Now, we’re adding the even deeper pink fine glass glitter. 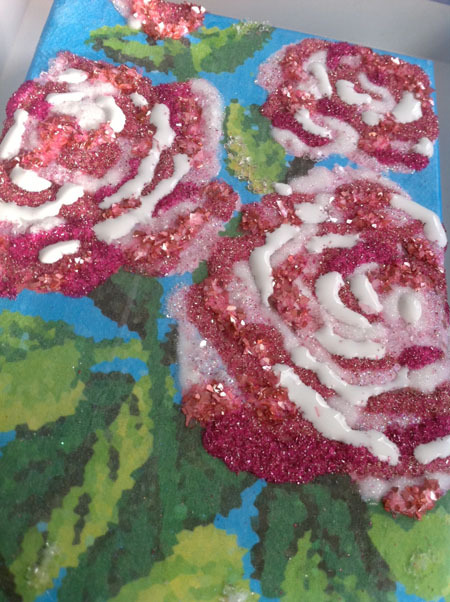 I’m using Art Institute Glitter #601 “Royal Rose” Fine Glass Glitter. Put down your glue, add glitter, shake & tap off. 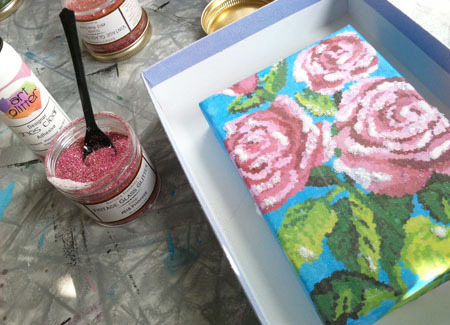 Don’t forget to add glitter to the sides of the canvas, too! 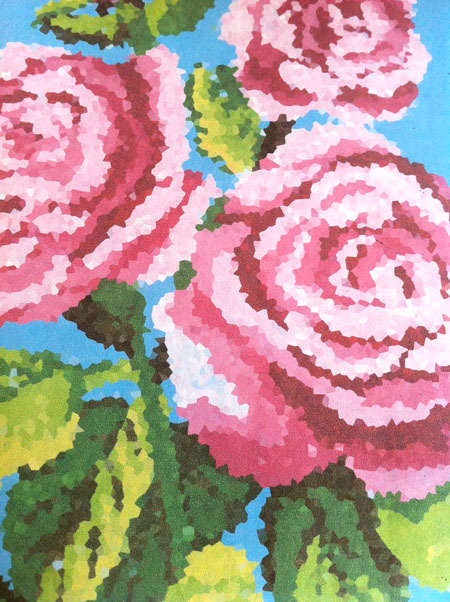 Now, you should be at the last color block, which is the darkest red shadow area on the roses. If you have more areas showing through, no problem! Just go back and repeat the steps above until you only have the darkest red patches left. I must mention… this is where it gets a tad tricky. 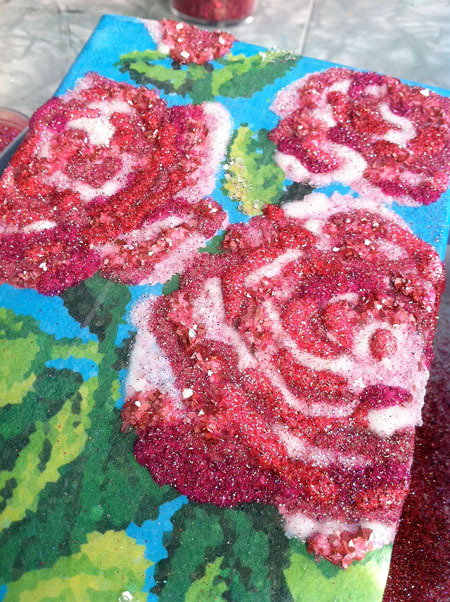 I’ve picked out two glitter colors for the darkest areas of the roses. 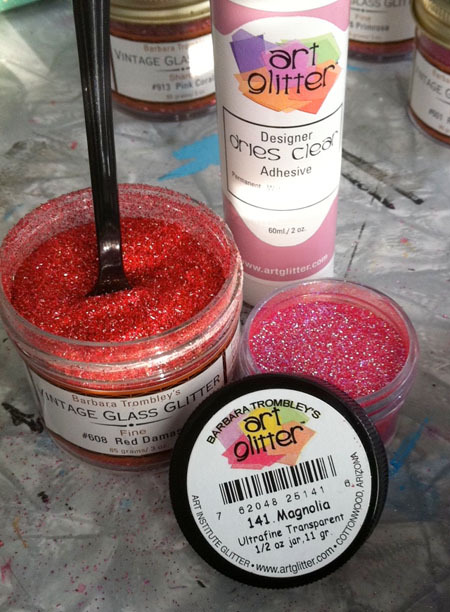 Art Institute Glitter #608 “Red Damask” Fine Glass Glitter and #141 “Magnolia” Ultrafine Transparent mylar glitter. Then, I’m going to very lightly sprinkle the lighter magenta color down first. We’re going to be mixing colors here and you don’t want to be too heavy handed with either color. 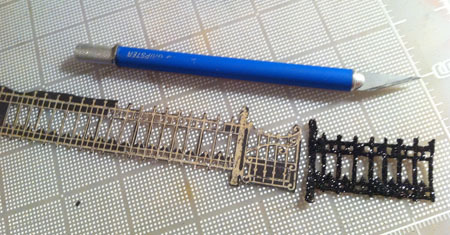 Don’t cover up all the glue, leave some glue exposed for the red, which is coming next. 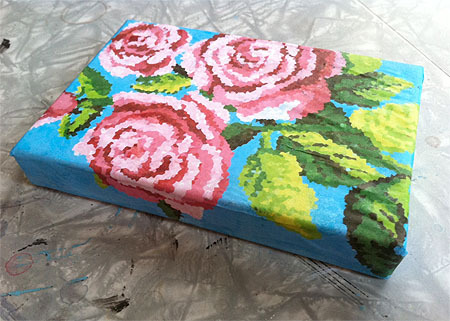 Don’t forget to add glitter to the sides of the canvas, too! 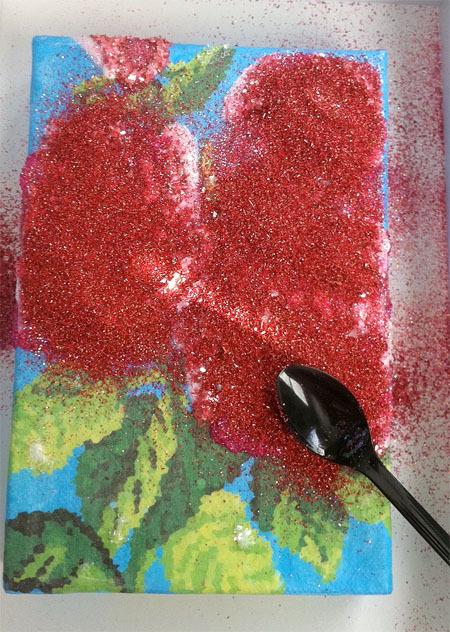 Add the red fine glass glitter. I’ve used my little spoon to add a very slight amount of pressure to push the red into the glue so the magenta we just put down doesn’t get all the attention. Let’s pause for a moment to look at our handiwork. 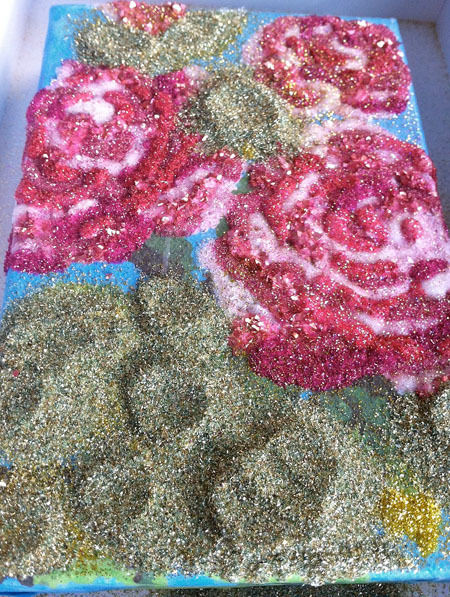 That’s a LOT of glitter… it’s sort of like a Monet painting, it’s going to look a little better from a distance, trust me. 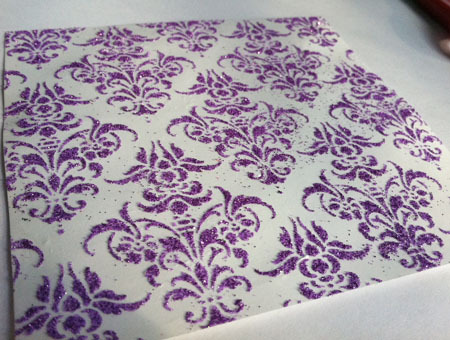 The texture, color and sparkle is going to look fantastic when it’s done! I first put down some glue on the lightest areas of the leaves, and dusted that area with the #5 yellowy “Cat Eyes” color. 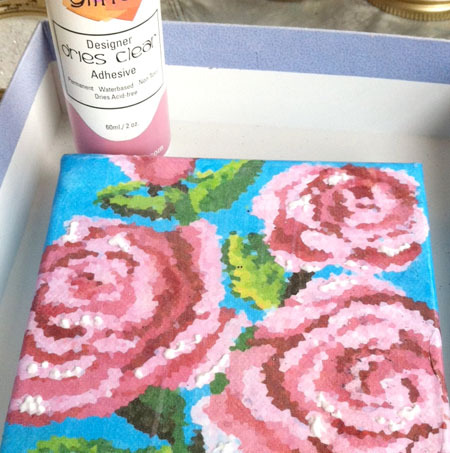 Don’t forget to add glitter to the sides of the canvas, too! I then went over that dusting with the #4 color, “Peapod”. 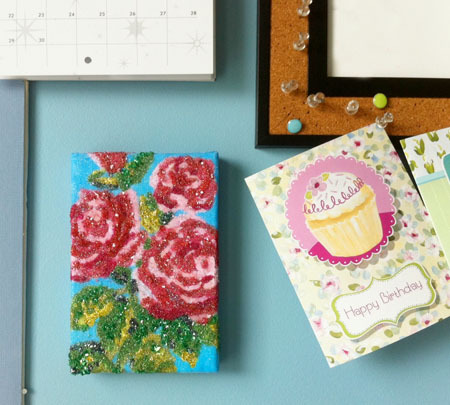 Don’t forget to add glitter to the sides of the canvas, too! 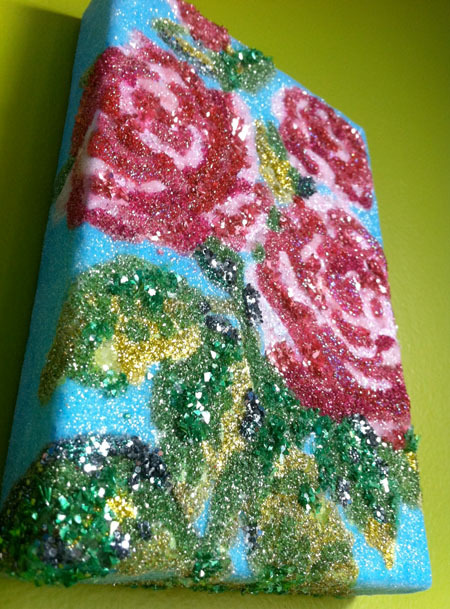 Keep adding color, #2 “Peridot” and #603, Shamrock… Don’t forget to add glitter to the sides of the canvas, too! Then for the very last dark green area, put down your glue and add a mix of the #1 color, “Summertree” and the #6 color “Gunmetal”. 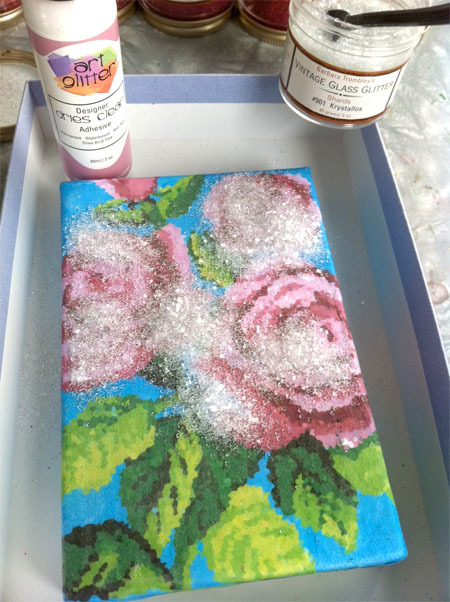 Don’t forget to add glitter to the sides of the canvas, too! 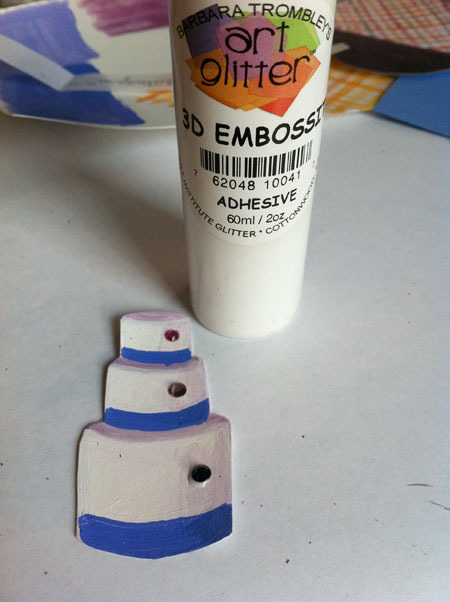 Cover the blue areas with glue… don’t forget the sides! 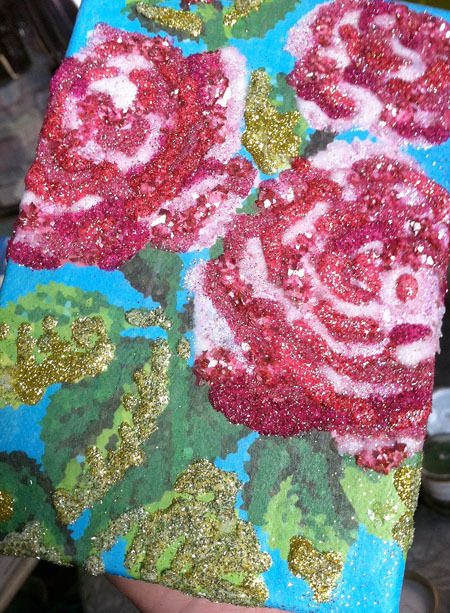 And here it is… dried after a few hours… covered in glitter!! I hung it on the wall that is directly behind my computer in my studio so I can gaze at it all day long. 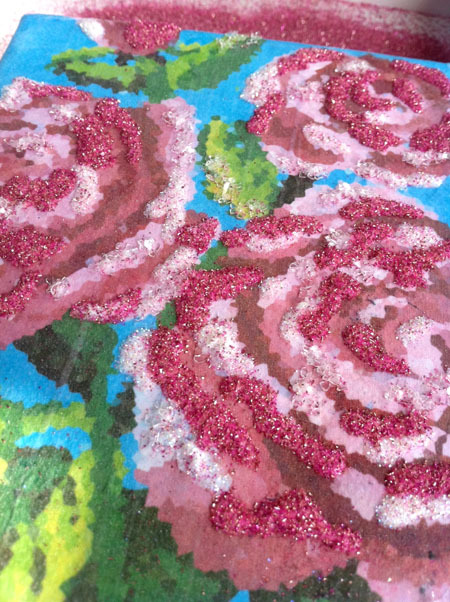 It shimmers and glitters and catches my eye when I walk in… I just love it! Hope you have fun making yours! 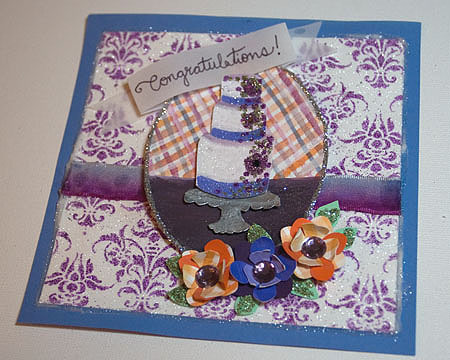 Today I’m making a “Congratulations” wedding cake card using the double glitter method. 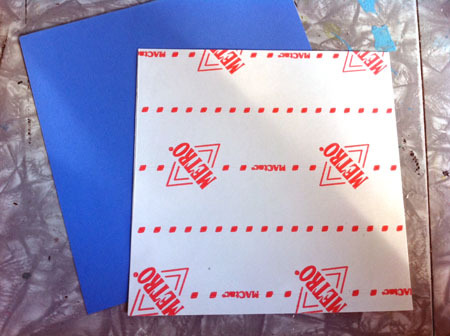 1 piece of 8 1/2 x 11 sticky paper (full sheet label paper where the back peels off). They use double sided sticky paper in the instructional video below, but it’s not necessary. First, I glued down my sticky paper, non-sticky side down, to a piece of plain card stock. 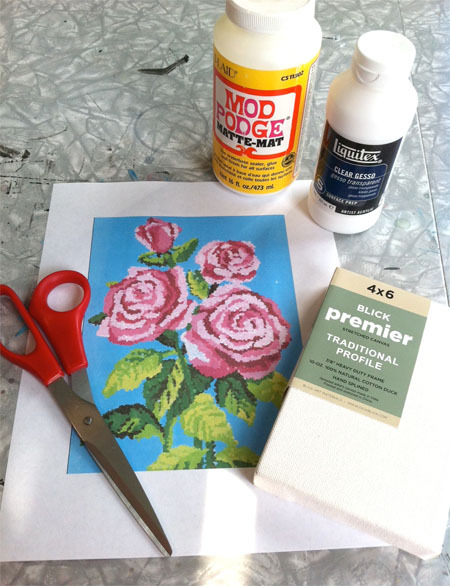 After this is dry, cut it to 5 1/4″ x 5 1/4″. 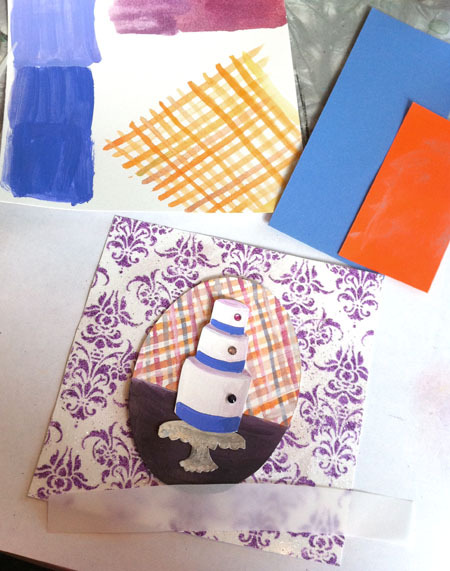 I also cut a piece of periwinkle construction paper to 6″ x 6″. 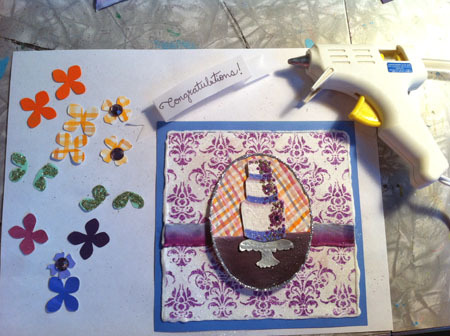 This will be the back of your card (but don’t glue them together just yet). 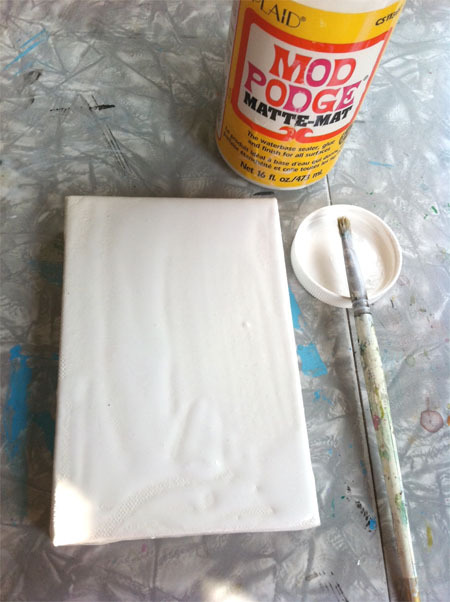 Next, soap up the back of your stencil (as shown in the video), remove the backing of your sticky paper so the sticky side is up and carefully put your stencil soap side down. I then scooped some of the #609 Grape Arbor down and carefully pressed it into the stencil. Tap off the purple. 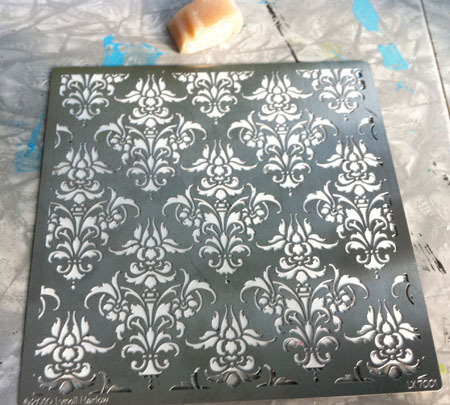 After I carefully removed the paper from the stencil, this is what it looked like! Then, I made a second pass with the clear #89 Martini glitter. I love how the purple pops through! An oval with a dark purpley-eggplant bottom with gingham top. The top is watercolor and the bottom is acrylic paint. A three-tier wedding cake. I used white acrylic paint with purple shadow accents and a periwinkle fondant ribbon on the bottom of each tier. A little cake stand that I painted silver. 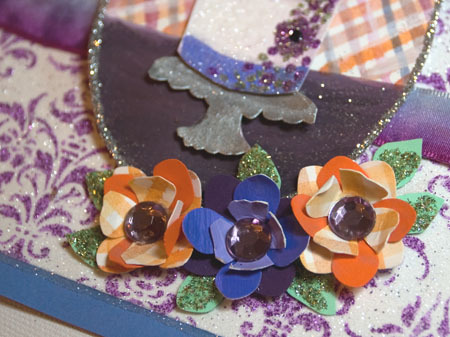 Some background colors in orange gingham and solid purple colors for the punched out flowers. 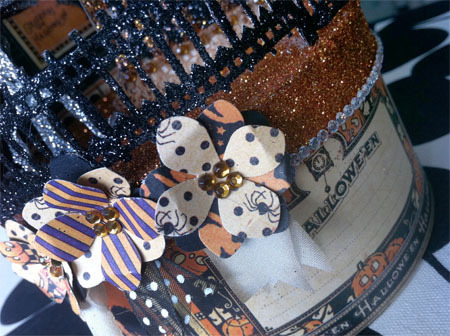 I cut each element out and added three rhinestones to the cake. 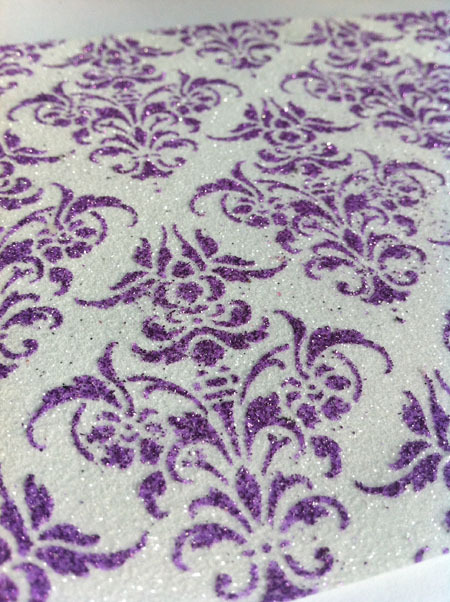 To give the cake the look of decorated fondant, I used the 3D Embossit and added dots of Peapod, Thistle and Grape Arbor glitter. 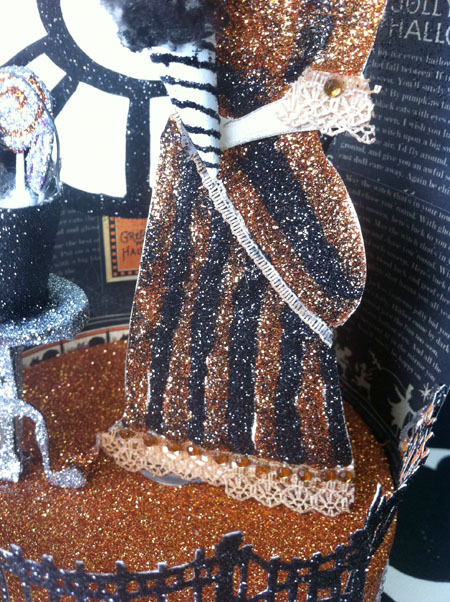 I also added dots and swirls of the 3D Embossit to the white areas and put the clear Martini glitter over that. Here’s what the cake looked like finished. Here are all the elements, ready to glue down. The flower petals, the leaves (flower petals cut in half. These were covered in the Peapod fine glass glitter). 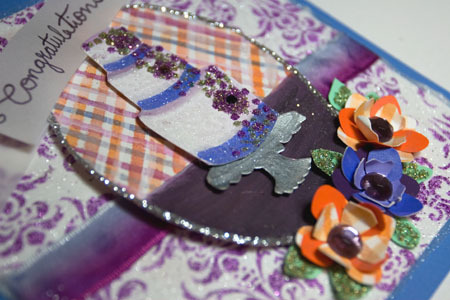 Some have already been glued down like the piece of ribbon down onto the glittered damask and then that entire piece was glued down to the periwinkle 6″ x 6″ piece of paper. 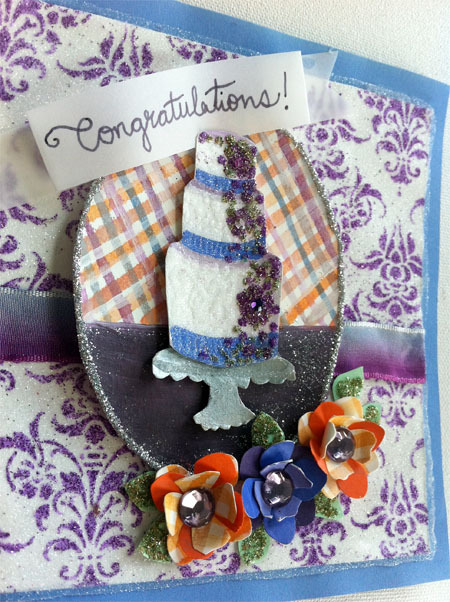 I punched out flower petals in the different purple colors and in the orange and orange gingham. 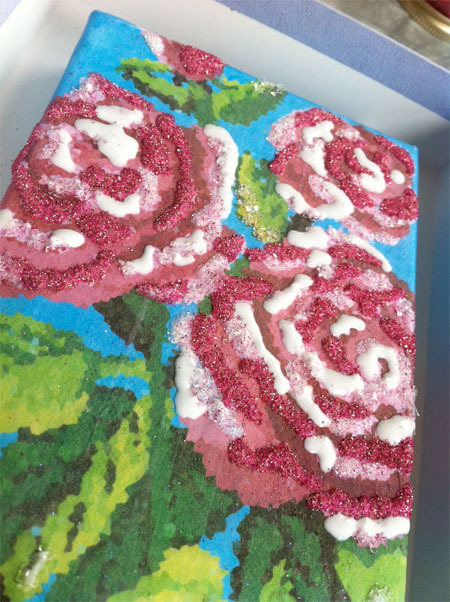 I glued down rhinestones inside the center-most flower petals, outlined the cake background oval in Silver glitter, wrote “Congratulations” on the little vellum banner and got it folded and ready to glue down.